In the US, most of us will be celebrating Labor Day today by NOT laboring. Around the world, though, there are a number of creatures that will be working, as they unfortunately do most days. For those of us who prefer their wildlife to remain wild, working elephants are an unnatural, upsetting reminder of human's capacity to be cruel to their fellow species. Here are three of some of the more unkind and unsettling industries in which elephants will be put through the paces today. Elephant acts in circuses used to be much more prevalent, but many government bodies -- including New York State -- have shut them down. Still, Florida is a state that continues to allow circuses, such as Carson and Barnes, to exploit working elephants. Carson and Barnes, in fact, has been choreographing elephant acts to the music of, among others, the B-52s, which prompted the iconic band to pen an open cease-and-desist letter to the circus. Elephants have played a critical role in logging in Myanmar for centuries. It's arduous work, "Dragging giant tree trunks up and down the steep hillsides of sweltering jungles," as the New York Times put it. Not only is the labor difficult -- and the training brutal -- but the elephants are contributing "to their own ruin," tktk as they clear forests where they would naturally live that will become land for farmers where they will no longer be welcome. 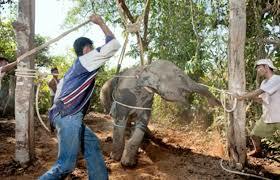 Notably, logging elephants are captured from the wild -- a turn of events that also will contribute to their demise. A study found that elephants captured from the wild and used in the logging industry will live lives up to seven years shorter than even those born in captivity in zoos. Travelers to Thailand and Myanmar looking for an interactive-nature activity often have the option of getting a hands-on experience with elephants. They should reconsider. While it may seem fun to "play" with elephants, there is an exceptionally cruel behind-the-scenes "training" process that tames wild elephants, called "phajaan." Phajaan involves breaking an animal's spirits -- tying it up in a tiny cage so that it can't move, repeatedly bashing and stabbing it with bull hooks and other metal instruments, screaming at it and disorienting it, and starving it. It is a process that may last for weeks until animal is "broken."